Thailand has a seemingly endless variety of food stuffs to wade through. On my block alone, every 2.5 steps there is a different street vendor–one sells roasted bananas, another rocks a cleaver preparing a Hunan chicken dish, while a young lady sells a fresh veggie soup made to order and her neighbor rolls out sticky peanut and rice balls all evening. It’s endless and altogether overwhelming when trying to make a decision. But overwhelming in an awesome way. Your senses take an adventure every time you step outside. Jasmine garlands, grilled catfish, and wok oil perfume the air. Candles, red lanterns and neon pink taxis tickle the eyes. The options for the mouth, though, are like Disneyland. It’s like Alice in Wonderland meets Captain Eo: exotic, sometimes bizarre, colorful and you might scream from pure joy (everyone did that while watching Michael Jackson act, right??). The food doesn’t blatantly say ‘Eat Me’ like those cookies Alice finds and then stuffs in her mouth…but it practically does. I can’t help but walk down the street and peer into every cart. I would probably step on a dog if it were in my way. There are just too many places to look besides where you’re actually going! Every vendor specializes in a particular dish or dishes, and day in and day out, they make those dishes hundreds of times. So you can imagine, most of them are pretty skilled. It’s actually quite difficult to eat poorly on the streets of Thailand (unless you’re near Kao San road, but that’s a different story). 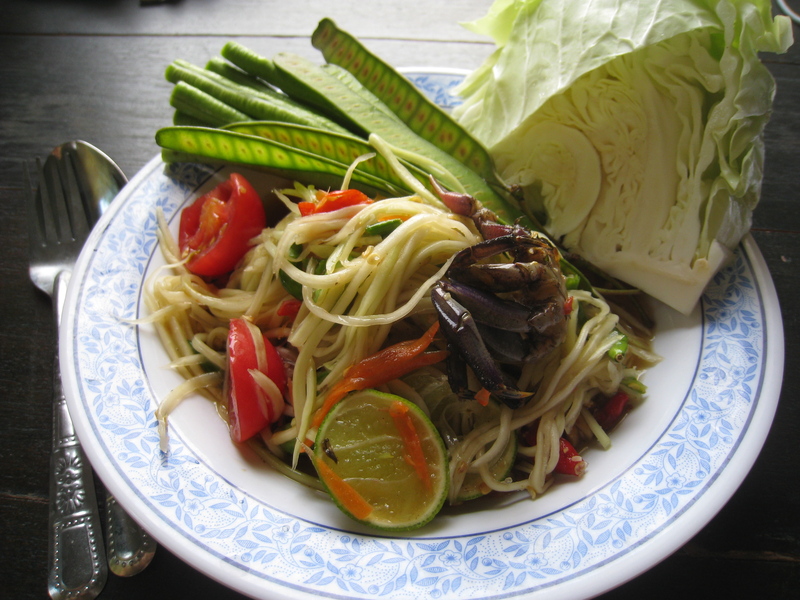 Thai is sweet, with a lighter flavor–the dressing made from fish sauce, sugar, lime juice and a touch of tamarind water. Som tam Lao hits different flavor notes, specifically more pungent ones. The sauce uses a fermented fish sauce that is heavier and thicker than nam pla, and citrus fruits that I’ve never seen before are added for a zingy bite. In both versions, you can add bu, or salted whole crabs. Either version is tasty, but I think the Lao version is more of an acquired taste. So my new lady never is not making a salad. 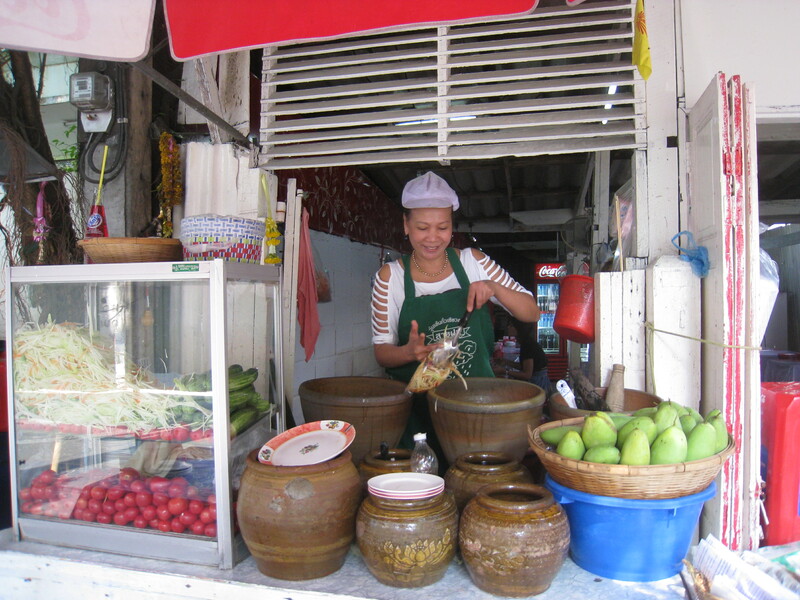 She is queen of the som tam and is surrounded by her trusty mortar minions. The salads are so simple, but she nails it with the right amounts of each ingredient every time. Her tomatoes are juicy and sweet, her dried shrimp are larger than average, and the salted crabs she uses are kept on a bed of ice (which I never see at any other stall). She is meticulous about the quality of her ingredients. The first time I bought a salad, I was a bit surprised when she asked for 40 Baht (about $1.30 US). I usually pay 15-30 Baht for a papaya salad. But when I got home and tucked into the salad, I realized that she was right for asking that price. Her salad plays with every taste bud–the lime and fish sauce smack around for a bit while the chili sneaks up with a swift kick to the tip of the tongue (I always ask for my salads phet phet, or very spicy), while the sweeter and more bitter flavors wrestle around for some attention too. Each bite is like a boxing match in your mouth. Which flavor will come out on top? Who cares! And when it all gets a bit overwhelming and heated? Break time. Go sit in your corner and give your mouth a rest with a bit of cool cabbage, long beans and crunchy cucumber. A glass of milk wouldn’t hurt either. Som tam, Thai or Lao, either way it’s an incredibly light and refreshing salad…even when it makes you break a sweat and cross your eyes. The woman doesn’t have a name on her restaurant and my Thai isn’t proficient enough to ask yet. So how to find her place? Go to Convent Road, in between Silom and Sathorn and head up Soi 2. On your right hand side, about 100 meters down, there’s a woman in a tiny restaurant standing in a window surrounded by mortars and pestles. Eat there! I am just sick with food envy after reading this article. I hate you- 😉 ❤ -! Hers beats out all out the papaya salad in NYC! Good eats!